Language: A three-year-olds verbal language is developing rapidly. This is a wonderful time for learning new vocabulary as one listens to stories and talks with friends. Each day includes at least one story-time. Key concepts are introduced through quality children's literature, song, and finger-plays. Math: Math concepts that are introduced in the 3-year-old program include shapes, rote counting, and beginning one-to-one correspondence. Science and Our World: Natural elements such as flowers, plants, rocks, pinecones, and caterpillars are brought into the classroom for observation. We learn about our world through our senses. We talk about what we see, hear, feel, taste, & smell. We share thoughts on what we know & what we wonder. A variety of sensory materials are offered for exploration, including play-dough and play in our sensory table. Christian Faith: Children listen to weekly Bible stories, learn songs & common prayers, and attend chapel each week. Gross Motor Skills : Faith Preschool has a large gym where students play daily. 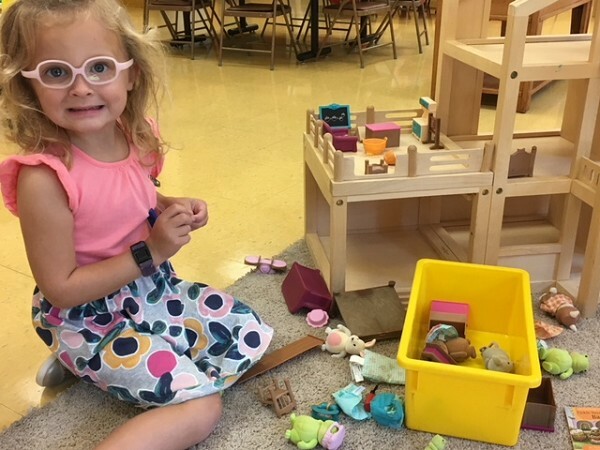 Here they have the opportunity to practice large motor skill activities such as scooters, running, bouncing and catching balls, sliding, and using a balance beam. Our teachers provide opportunities for group games, as well as, free play. Music & movement are also a part of our classroom activities. Fine Motor Skills: Developing strength in little fingers is a task needed for pre-writing. Playdough and art are perfect for developing in this area. Classroom manipulatives that require the pinching of an object to pick it up also help in the task of coordinating finger muscles. Art Activities: Our students are given many opportunities for process-oriented art. They are given the opportunity to make their own creations while they paint, draw, and build. Students are given opportunities to tear paper, use scissors, and glue a variety of materials. Listening Skills: Children learn to listen to teachers, classmates, and other adults. They begin with simple instructions and practice following multi-step directions. Emotional Development: Children learn to identify and verbalize feelings they experience and see in others. Children's literature is shared to discuss various emotions. A special spot in our classroom is set aside as a cozy place to get away to when one is upset or just needs a little alone time. Teachers are available to help children identify feelings and soothe children as needed. We strive to provide a warm, friendly environment for the children.